The gold rush is on in Texas, and Big Oil is scrambling for a piece of the action. The oil industry is shelling out billions of dollars in a series of acquisitions in the Permian Basin, the hottest oilfield in the world. The latest deal came on Tuesday when Diamondback Energy (FANG) agreed to purchase shale producer Energen (EGN) for $9.2 billion, forming one of the largest players in the Permian. Late last month, BP (BP) inked a $10.5 billion deal to buy oil assets in Texas. It was BP's biggest acquisition in two decades and first major investment in the United States since the Deepwater Horizon disaster in 2010. And Concho Resources (CXO) recently completed a $9.5 billion purchase of RSP Permian that created the largest shale producer in the Permian. The rush of deals underscores how eager companies are to get a foothold in the region. Rapid technological advances have dramatically slashed the cost to frack in the Permian. 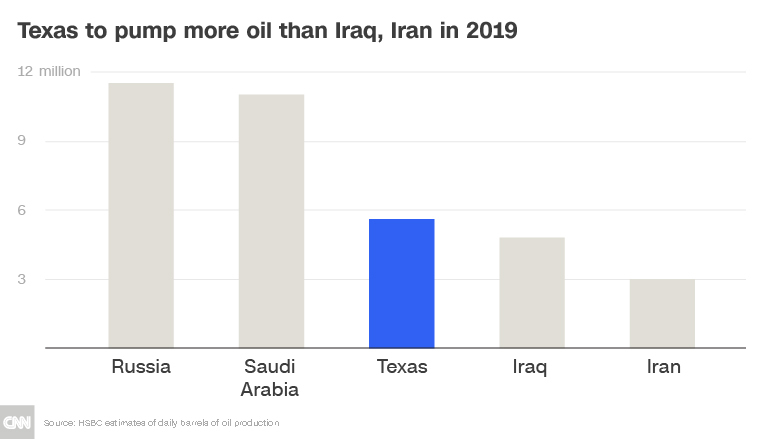 Production is spiking so much that Texas is on track to surpass Iran and Iraq, both OPEC members. That would make Texas No. 3 in the world if it were a country. "It's the most desired region in the United States, if not globally," said Michael Tran, director of global energy strategy at RBC Capital Markets. RBC estimates that Permian production will more than double over the next seven to 10 years, to about 6.5 million barrels per day. That's more than the entire United States produced in early 2012. "From a price perspective, the Permian Basin is extremely attractive," Tran said. "Nobody doubts the rock." The Permian boasts unique geology that allows oil companies to drill more than one layer of the earth at the same time. Wells can be profitable below $40 a barrel. That's well below today's price of about $65 a barrel. And some executives believe the amount of Permian oil rivals Saudi Arabia's legendary Ghawar Field, the world's largest conventional oilfield. By spending $9.2 billion in stock, Alabama-based Diamondback is nearly doubling its acreage in core parts of the Permian Basin. "They're as good as some of the assets we've seen anywhere," Michael Hollis, president of Diamondback Energy, told analysts on Wednesday. "We were really impressed once we got under the hood." Wall Street was less impressed. Diamondback shares plunged nearly 11% on Wednesday. Just days earlier, Diamondback swept in with a $1.25 billion deal to buy private Permian oil producer Ajax Resources. Even some of the biggest oil companies are getting into the game. Long before BP's big bet on shale, ExxonMobil (XOM) announced a $5.6 billion deal in January 2017 to double its assets in the Permian Basin. It was Exxon's biggest purchase since the 2010 takeover of natural gas producer XTO Energy. That $41 billion acquisition proved to be badly timed as natural gas prices later crashed. But major obstacles loom in the booming Permian Basin, at least in the short run. Because of hyper growth, the Permian is quickly running out of pipelines to move oil out of the region. "The pipeline constraints are real, but they are transitory," said Vincent Piazza, senior energy analyst at Bloomberg Intelligence. "The infrastructure has had a difficult time keeping up with the explosive growth. More pipelines are coming, but they will take time. Clay Seigle, managing director of oil at research firm Genscape, warned of "significant challenges" for transporting oil out of the Permian until the second half of next year. At the same time, Permian producers are feeling sticker shock as prices spike for talent, supplies and services. Oil executives are betting they can maximize their chances of success by working together. The recent deals "signal a clear shift in the US shale industry towards consolidation as players seek operational and capital efficiencies," analysts at research firm Rystad Energy wrote in a report on Wednesday. The boom in the Permian has sparked some concerns that the shale industry could be overextending itself once again. 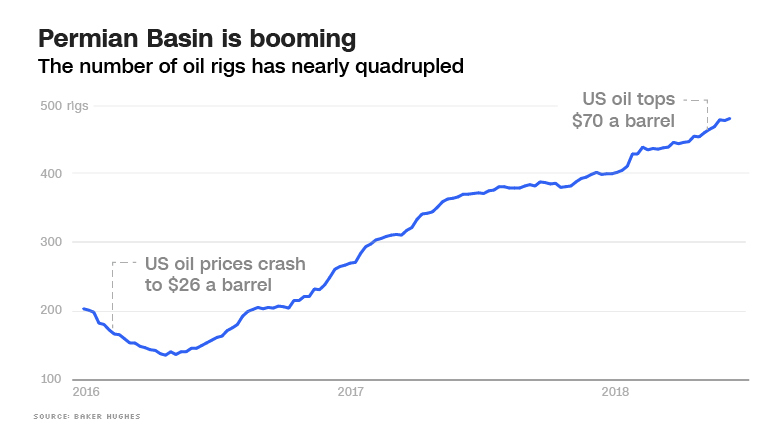 It was just a few years ago that excessive shale production caused oil prices to crash around the world. Dozens of US oil companies filed for bankruptcy. Big Oil is betting this time will be different because the oil glut has largely disappeared, demand is strong and OPEC has less firepower to respond to price shocks. US crude prices plunged 3.5% on Wednesday, but they have nearly tripled since early 2016. "The market is going to need more barrels," RBC's Tran said. 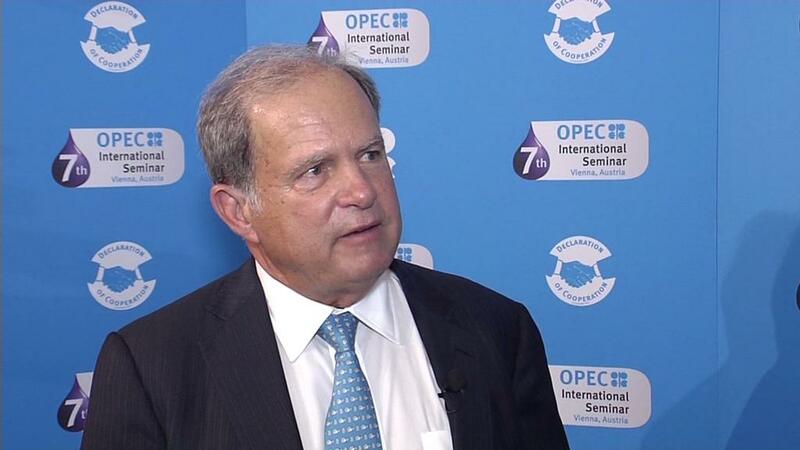 "OPEC and the Saudis can only do so much."